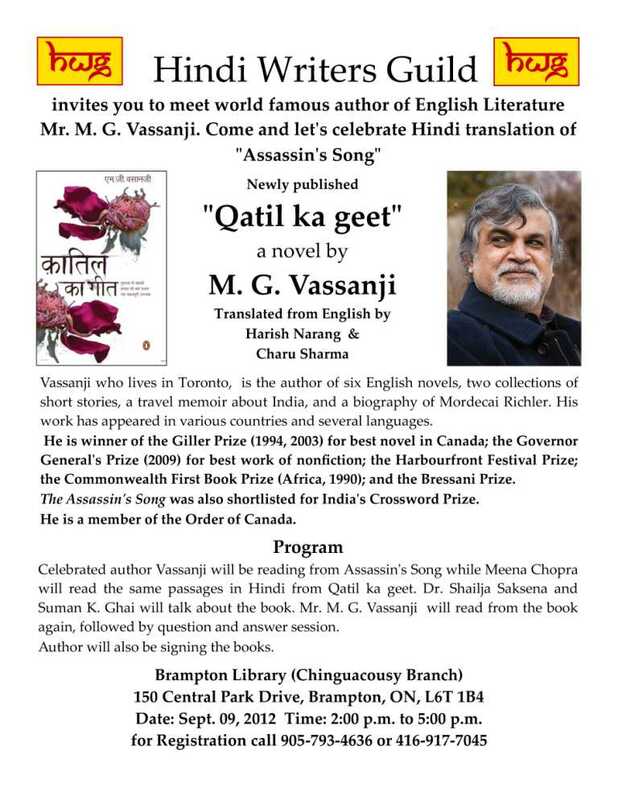 Harish Narang and Charu Sharma’s Hindi translation of MG Vassanji’s Assassin’s Song was launched at the Brampton library Sunday afternoon by the Hindi Writers Guild. Vassanji read three passages from the novel in English, Meena Chopra, poet and painter, read from the Hindi translation of the passages, and Dr. Shailaja Saxena and Suman K. Ghai critiqued the novel. The book was formally launched in India in July 2012. 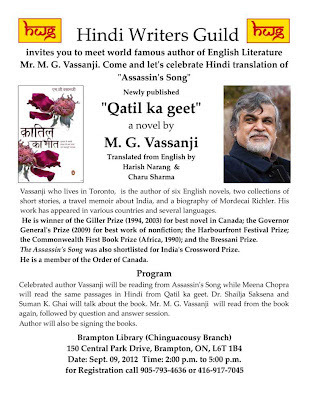 It was a rare public reading by the two-time Giller winner Vassanji. He read three passages from the novel – Sufi Nur Fazal’s first encounter with the princess, young Karsan’s meeting with his father who is the head of the Pirbaag shrine, and the letter Karsan writes to his father informing him that he rejects his spiritual inheritance. Meena Chopra read the Hindi passages and included some parts that Vassanji hadn’t read, thus giving a better perspective and a fuller portrait of the novel. 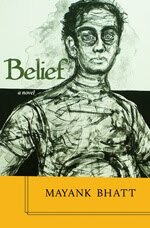 The tour de force of the afternoon was Dr. Saxena’s commentary of the novel. In an erudite and studied presentation on the novel, Dr. Saxena delineated the strengths of the novel – especially the seamless weaving of the three eras – the 13th century, the 1960s and 1970s and the 2002-03 period – that form the part of the novel. Another telling comment, which revealed the depth of her understanding of the techniques of storytelling, was her description of the characters in the book – the Saheb, the mother, Karsan, Karsan’s younger brother Mansoor who becomes a militant Muslim in post-2002 Gujarat, and Pirbaag – the Sufi shrine. Only a truly discerning reader would describe a location as a character. And Pirbaag is, indeed, no less than a character in the novel. Suman K. Ghai’s commentary highlighted Vassanji’s effortless characterisation, and the dexterous translation; he also emphasized that Vassanji has been able to capture some of the comedic aspects of an immigrant’s life in the 1970s. The event had become possible thanks to Meena Chopra’s continuous efforts. Thank you Mayank for all your efforts from Me and on behalf of HIndi Writers' Gulid. The review above is beautifully written.